Q. ‘Fine dust’ vs. ‘ultrafine dust’? A particle of “ultrafine dust,” or particulate matter 2.5 is smaller than 2.5 micrometers in diameter. The width of PM2.5 is about 30 times less than that of a human hair. “Fine dust,” or PM10, is particulate matter 10 micrometers or smaller in diameter. In South Korea, the average level of PM2.5 was 25.1 micrograms per cubic meter in 2017, the worst among 35 member states of the Organization for Economic Cooperation and Development. The OECD average was 12.5 micrograms per cubic meter. Q. Where does fine dust come from? Toxic particles carried by the wind from neighboring countries and changing weather patterns -- such as slowing wind speed stemming from climate change -- are main contributors to the hazardous levels of particulate pollution in South Korea. Domestically, fine particles primarily come from emissions from diesel vehicles, ships, construction equipment and other operations involving the burning of fuels such as coal, wood and oil. Toxic particles are generated indoors, too. When meat and fish are grilled or fried indoors, for example, levels of ultrafine dust easily go over 100 micrograms per cubic meter. Tobacco smoke and burning candles also produce dust particles. The widespread perception in South Korea is that a large proportion of the dust originates from industrial areas in China, but there is a lack of scientific research to determine China’s contribution to the air pollution here. The state-run National Institute of Environmental Research attributed 75 percent of PM2.5 on average to overseas sources -- China, Mongolia, North Korea and Japan -- when the country suffered from hazardous levels of ultrafine dust for five days straight in January. Q. When are dust levels high? The particle pollution chokes South Korea typically between November and May. The pollution in winter is getting worse every year in large part due to a northwesterly wind from China and high volatility in temperatures, which is affected by global warming, experts say. The fluctuations in temperature between day and night slows wind speeds, causing stagnant air masses on warm days. High pressure systems also trap dust particles in the atmosphere near the ground, worsening air quality. 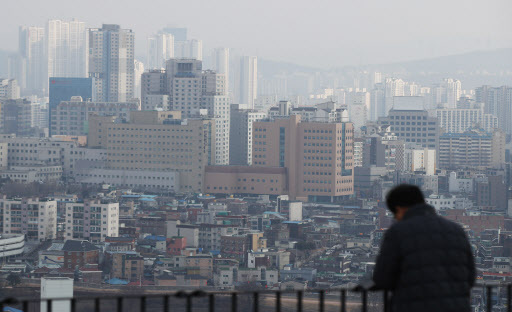 In January, the density of PM2.5 in all areas was high for four days straight because fine dust particles had accumulated in and out of the country due to a lack of wind, as well as due to additional inflow of dust particles from overseas, according to the Korea Meteorological Administration. According to Air Korea, PM2.5 levels typically have begun to rise in November and hovered around a monthly average of 15 to 35 micrograms, before the levels dropped in the summer, over the past years. Q. How dangerous is fine dust to health? Fine particles can penetrate into the respiratory system, reaching the lungs and bloodstream. The smaller the diameter, the deeper the particles can travel into the respiratory tract and the more dangerous it is to human bodies. Exposure to fine particles can cause short-term health effects such as skin, eye and respiratory system irritation. In the long term, exposure to fine particles not only worsens medical conditions such as asthma, but can also causes a variety of illnesses, including cerebrovascular diseases, heart disease and cancer. Recent studies have shown that particulate pollution is also linked to mental diseases such as depression and dementia. People with breathing and heart problems, children and the elderly are especially at risk. Q. What should you do on high dust days? When dust levels are high, it may be best to avoid going outside and to reduce exposure. If it is inevitable to go outside, it is advised to wear a dust mask with a mark of “KF 80” or above. KF, for Korean Filter, is a rating system approved by the Ministry of Food and Drug Safety. KF 80 masks filter out 80 percent of PM2.5 particles and KF94 masks can block 94 percent of fine dust. It is best not to reuse disposable masks. When the masks are washed with soap, their capacity of blocking dust drops significantly. Outdoor particles could come indoors with you. Shake dust off your clothes before entering your house, and wash your hands and face. The use of air purifiers inside could be helpful as well. It is important to drink water frequently to keep yourself hydrated. Fluids inside your body help cleanse your body of toxins through sweat and urine. Eating fruits, vegetables and seaweed could also help discharge hazardous substances from the body.